Developing an understanding of nutrition from an early age. Do you know what constitutes a portion for the 5-a-day? Why are fruit and vegetables good for us? 30% of children are now officially classed as being obese in the UK. The cost to the NHS for treating obesity and related illnesses runs into the billions (Obesity about £5 billion and type 2 Diabetes £8 billion). Despite lots of publicity how many people have actually changed their eating habits? Children are more ready to take on change and learn about nutrition than adults, so an obvious step is to provide appropriate intervention in schools, getting the message across to adults from a different direction. Top Chomps cards provide a proven, engaging and dynamic game format for children age 7-14 to learn about nutrition. With the associated teaching materials they provide a great opportunity for intervention. 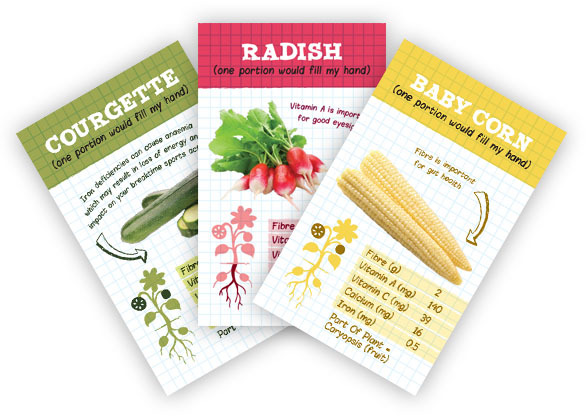 We've made all the nutritional data on our cards available here so you can easily extend the Top Chomps concept. We've created free resources you can use in the classroom across a broad number of subjects and key stages. Check out the news section for more information on Top Chomps and how the cards and resources are being used.